As we walked towards the kennel, the dogs pulled their chains and barked and howled ferociously, as if to say “pick me, pick me!” One even climbed out of its kennel, scaling the two-metre high fence. If you think having dogs pull a sled is cruel, think again – these dogs are made for the task and they delight in it. With the help of our expert guides we packed the sleds, chose a team of eight handsome dogs and harnessed them to the sled. We had been instructed in the basics of dogsledding, what commands to give when, when to get on the sled, when to step on the brake and when to hang on for dear life. This was to be no easy trip but a true workout – as your dogteam pulls around a corner, you need all your weight and power to keep the sled from overturning. Off we went, through the backwoods bordering Algonquin, in the tracks of the coureurs de bois and trappers of old. I travelled with Chocpaw Expeditions out of South River, 45 minutes north of Huntsville. 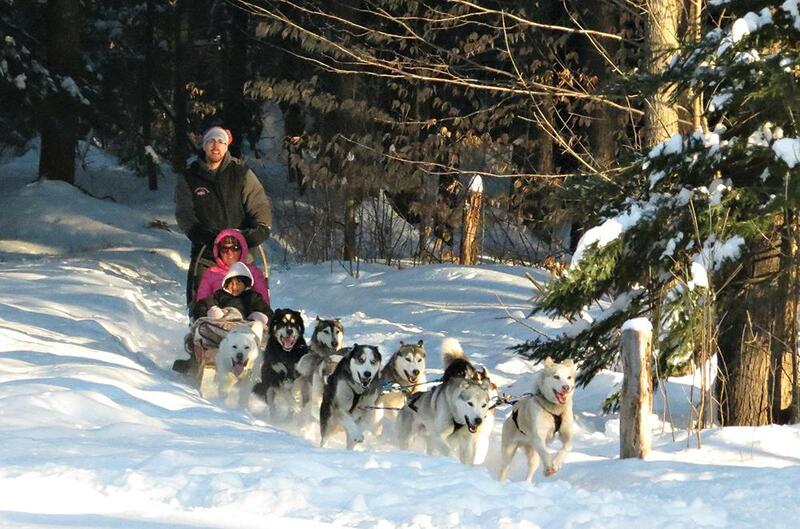 Chocpaw has been providing dog sledding adventures for over 40 years. We were accompanied by experienced guides who shared their love for the dogs, their knowledge of the wilderness and who recounted the stories of those who have gone before. We travelled through the beautiful snow-covered forests for a good number of hours, before we reached a camp of prospector tents, set beside a frozen river. The tents were heated with wood burning stoves (one on each end) that provide plenty of warmth. The tents have raised plywood sleeping platforms and a place to dry clothing (you do work up a sweat!). After we arrived we first took care of the dogs and made sure they were fed and watered. After this there were chores for each of us – gathering and cutting fire wood; hauling and heating water; food preparation and clean-up. It may seem like a lot of work, but it makes you feel like you are part of a genuine trip in the wilderness rather than a luxurious catered affair. Over a delicious meal we listened to stories of adventure as told by our guide. Someone had brought along a guitar while others bedded down in their sleeping bags and mellowed out. Before going to bed myself I took a late-evening walk and marvelled at the thousands of stars spread out above. That night I slept like a baby, then retraced our tracks back to base camp. If staying overnight in tents feels a bit daunting to you, there are plenty of day trips to be had. Aforementioned Chocpaws offers them, as do North Ridge Ranch in Huntsville, Winterdance in Haliburton and Wilderness Adventures in Algonquin. When you go, be sure to dress warm and in layers. Your undergarments should wick any perspiration from your body, your mid-layer should keep you warm while your outer layer needs to keep you dry and sheltered from the wind. Bring a spare dry set of clothing and drink plenty of water.